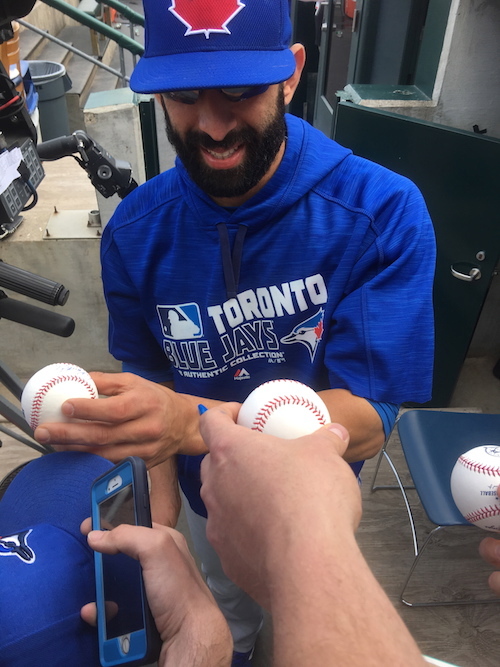 Here is an original photo of Blue Jays superstar OF Jose Bautista signing autographs recently at Comerica Park in Detroit. The shot was gathered by iFolloSports.com Michigan based correspondent Lance Martinez. Bautista is one of baseball’s best sluggers and one of the game’s more polarizing figures. During last season's ALDS against the Rangers, the Dominican Republic native did a huge bat flip after blasting the go-ahead home run in Game 5. This did not sit kindly with Texas, who retaliated this season by throwing at him. Bautista was later clocked in the face by Rangers 2B Rougned Odor. The 35-year-old has compiled some big numbers since 2010, posting at least 35 homeruns and 100 RBI in four of those campaigns. Within the past few days, Bautista was placed on the disabled list with a toe injury.